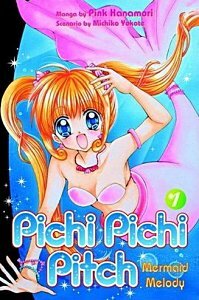 Mermaid Melody Pichi Pichi Pitch is a shojo manga about a mermaid, her love for a human boy and the deadly demons she must destroy. Shojo manga is a Japanese term meaning a comic book written for girls roughly 12 to 14 years old. The most famous example in this country is Sailor Moon. Both are typical of the shojo style. They are sort of like lighter versions of Buffy the Vampire Slayer. They have cute girls, cute boys, love stories and demons, sometimes zombies. Mermaid Melody Pichi Pichi Pitch is about Lucia, a mermaid who gave her pearl to a boy she saved from drowning. Now Lucia needs her pearl to resurrect the sea goddess Aqua Regina and prevent demons from destroying the seven seas. To raise the goddess Aqua Regina, Lucia must gather together the other six sea princesses and their pearls. You see how it works? There are seven seas and seven princesses each with a magic pearl. In the meantime there are numerous demon attacks that Lucia fights off with the help of two other princesses: Hanon and Lina. They destroy the demons by singing in "pichi pichi pitch", a fun, light-hearted style. This is all light-hearted fun. It has all the necessary elements and enough plot twists and character development to rank as one of the best shojo stories in a long time. I can highly recommend it. Both the anime and manga are currently available for free online.